I read this article and found it very interesting, thought it might be something for you. The article is called The Top Male Olympic Skiers of All Timeand is located athttp://welove2ski.com/how-to-ski/top-olympic-male-skiers. So who are they, the greatest male alpine skiers of all time in the Olympic arena? These are the guys who either won the most medals or made the biggest international impact at the Winter Games. We’ve discussed this between us at Welove2ski, but here’s our definitive list. No doubt yours is different. Here are the top men – with women to follow next. Meanwhile, tell us who you think we’ve missed out. Bode Miller is one of only two male alpine skiers in history to win medals in all the four disciplines. His haul of six at Salt Lake City, ad Vancouver and Sochi includes Super-Combined gold in 2010. Where is he now? He wrote a book, Bode: Go Fast, Be Good, Have Fun. He last raced at the February 2015 World Championships, severing a hamstring tendon in a super-G crash. He will be going to PyeongChang as an Alpine skiing analyst for NBC Olympics. Kjetil Andre Aamodt is the other guy to win medals in all four disciplines and is one of the all-time greats. Who? I hear say? Fact is, unless you’re a World Cup fanatic from way back, you’ll find his name is not a household one. But the Norwegian, nicknamed Baby Shark, remains the most decorated skier of all time. He won no less than eight Olympic medals – four of them gold. What is more, he did this over four successive Games, winning Super G gold at Albertville in 1992 and finally again at Turin in 2006. 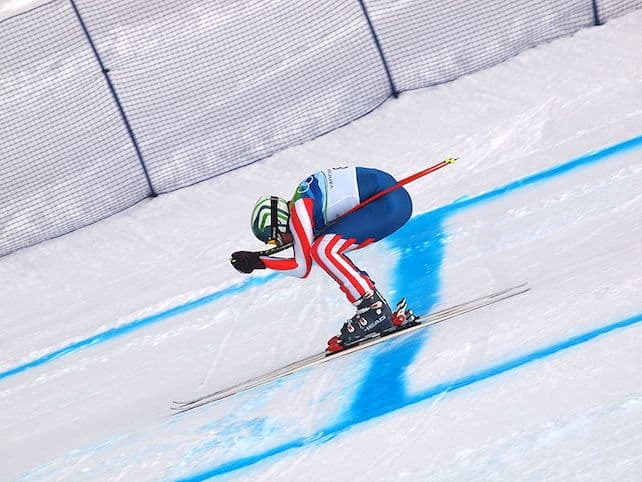 Aamodt is also the youngest – and the oldest – competitor to win gold. Most famous quote: “Maybe I should have shaved…” after losing to Tommy Moe by 0.04 seconds on Norwegian soil in the Olympic Downhill at Lillehammer in 1994. Where is he now? He’s a sports commentator and life coach. Jean-Claude Killy became the first ski hero to sweep the board in the then three alpine disciplines (Super-G came later) at Grenoble in 1968. His controversial start technique cause a kerfuffle at the time. By using his enormous upper body strength he threw himself through the starting gate to give himself a distinct advantage over his fellow competitors. Later he gave his name to Killy ski clothing and skis, as well as Espace Killy – the former name of the combined ski area of Val d’Isere and Tignes. He has worked as a ski instructor, actor, and racing driver. Where is he now? J-C is alive and well and was a member of the International Olympic Committee until 2014. He chaired the coordination committee for Turin 2006 and Sochi 2014, and has been an Honorary Member ever since. Toni Sailer takes third place on the podium for achieving the same extraordinary triple feat in 1956 at Cortina d’Ampezzo. The Blitz from Kitz was a formidable skier in all disciplines who then went on to make a career as singer – he recorded 18 albums – and as an actor. He appeared in 20 films, opened his own hotel, and became director of the Hahnenkamm Races. Most famous quote: “One doesn’t notice one’s reactions, nor how they arise. One just must have them. Skiing is really a test of subconscious reactions.” Where is he now? Sailer died in 2009. Up at the start, he supposedly told an opponent shaking with nerves: “Don’t worry. There’s no reason to be tense because I’m the only one who needs to worry, since I’m the one who’s going to win. There’s no way you can.” Of course, Tomba won. Most famous quote: (1992) “I used to have a wild night with three women until 5am, but I am getting older. In the Olympic village here, I will live it up with five women, but only until 3am. Where is he now? In his 50s; he’s still unmarried. Ingemar Stenmark won bronze at Innsbruck in 1976 and two golds in Slalom and GS at Lake Placid in 1980. Unfairly, he was banned from competing at Sarajevo in 1984 on the grounds that he had turned professional and was therefore unable to defend his Slalom and GS titles. He remains one of the most successful skiers of all time with 86 wins in international races. Where is he now? In his native Lapland and elsewhere in Sweden he is one of two national celebrities on their own pillar of fame – Bjorn Borg is the other. Hermann ‘The Herminator’ Maier won two golds in 1998 at Nagano. His dramatic crash and its aftermath in the Downhill before a worldwide audience made him a sporting hero around the world. He fell at 85mph, landed on his head, became airborne, and tumbled through two sets of safety netting. Then he got up, skied away and won a gold medal a few days later. His life was as dramatic off the piste as it was on. While riding his motorbike he collided with a car in August 2001 and his left leg was left hanging by a thread. Competing in the 2002 Olympics was out of the question and most of us assumed his career was over. But no one told The Herminator. After reconstructive surgery he made one of the greatest comebacks of all time, regaining his World Cup titles. Where is he now? Back in Flachau in the Austrian region of Pongau where he grew up and remains a huge celebrity and role model for Austrian would-be racers. Lasse Kjus won five medals between 1994 and 2002, including gold in the Combined at Lillehammer. In the 1999 World Championships at Vail he won medals in all five disciplines, one of the most remarkable feats of all time in alpine skiing. Where is he now? In Norway dedicated to his Kjus brand of sportwear. He is also passionate golfer with a single handicap. Bernhard Russi won the Downhill at Sapporo in 1972 but is also remembered for coming just 0.33 seconds behind Franz Klammer (see below) on the Patscherkogel in the 1976 Innsbruck Olympics. His career since has somewhat eclipsed his double Olympic achievements, although it came about because of them. He went on to build Downhill courses in ski resorts across the world, including La Face in Val d’Isere for the 1992 Albertville Games, the Grizzly at Snowbasin for the downhill at the Salt Lake City 2002 Games, and the Banchetta in Sestriere for Turin in 2006. Where is he now? He has worked as a designer of Olympic ski runs since 1988. Most recently this includes the downhill course at Jeongseon for the PyeongChang 2018 Games. Where is he now? An international ambassador for Austrian skiing – when he is not playing golf. AND FINALLY lots of other truly great skiers have walked away with medals: Marcel Hirscher of Austria who won Gold in Giant Slalom and Combined at PyeongChang, Aksel Lund Svindal of Norway who won Gold in the Downhill at PyeongChang, and his countryman Stein Eriksen, Othmar Schneider of Austria, Pirmin Zurbriggen and Peter Muller of Switzerland, Phil and Steve Mahre of the USA and their countryman Tommy Moe – and this lot barely scratch the list of those we have left out. Also read our feature on The Top Female Olympic Skiers, The Best Resorts for a Winter Olympic Buzz, Sochi 2014 and PyeongChang 2018. Just back from Lech, where we stayed at the Kristberg, owned by 1964 Olympic downhill champion, Egon Zimmermann. Apart from the cups and medals, there’s a wonderful collection of photos in the lobby, including Gerald Ford, Jean Claude Killy, and Abba! Herr Zimmermann is full of great stories from his racing days. In the summer, he used to put on a 20kg rucksack and run down the Rufikopf to strengthen his legs. Great man. Lovely hotel. He is mentioned, in the penultimate paragraph. This feature is not about the best skiers, it’s specifically about the most successful Olympic skiers. Where is Gustavo Thoeni on this list?? 3 Olympic medals (1 Gold and 2 Silver) and 7 at the world championships (5 Gold and 2 Silver)! !